In 2010, the Salvadoran government contracted the services of the Spanish consulting firm the Tau Group, to perform a "Strategic Environmental Evaluation" of the issues surrounding the metallic mining industry in El Salvador. The report was to provide a basis for the Funes government to develop its own policy. To date the government's policy has consisted of a de facto ban on gold mining as the government refuses to issue new permits for the exploitation of gold resources in the country. That ban has led North American gold mining companies Pacific Rim and the Commerce Group to sue the country in international trade arbitrations. The evaluation report was apparently completed in September 2011, but the Funes government has delayed in making its results available. In Olympic qualifying matches as part of the CONCACAF tournament, the El Salvador U-23 team scored a last second goal to tie the US men's team and end the US chances of qualifying for the summer Olympics. El Salvador had the better record going into this final game of the preliminary round, and the last second goal, shown in this video, advanced El Salvaodor to the semi-finals and left the US hopes on the field. The top 2 of the remaining 4 teams will go to the summer games in London this year. The murder rate is down dramatically in El Salvador in the past two weeks. The rate has fallen from an average of 13 murders a day to only 5. But the reasons why are murky and confused. In my last post, I mentioned a report by the online periodical El Faro that the government had negotiated a deal with the gangs. The government denied this report. A new story has a Roman Catholic bishop asserting that the church brokered a peace between the two leading gangs. An El Salvadoran bishop has claimed that a recent drop in homicides is due to the Church negotiating a truce between the country's two main gangs, the MS-13 and Barrio 18, and that there was no government deal with these gangs. Did the government make a deal with the gangs? In the past week, there has been a 53% decrease in the level of homicides in El Salvador from the weekly average in the first 9 weeks of 2012. The online periodical El Faro published a report on Wednesday suggesting that this decrease was the result of a deal struck between the Salvadoran government and gang leaders. According to El Faro, 30 leaders of the Mara Salvatrucha and Barrio 18 gangs were transferred during the week of March 4 from the country's maximum security prison to lower security prisons where they can receive visits from relatives and have physical contact with visitors. This transfer was said to be part of a deal in which the transfers were made in return for the gangs reducing the number of murders. The El Faro report quoted a local leader of a Mara Salvatrucha cell who told of receiving a call from leaders in prison telling him the maras were now "on vacation:"
Some themes and analysis from this week's elections. 1. The resurgence of ARENA. After their trouncing in the 2009 presidential election and then the defection of 12 GANA deputies, some wondered whether the best days for the right wing ARENA party were in the past. ARENA's recovery to have the largest number of seats in the National Assembly and to hold the principal cities in 9 of El Salvador's 14 departments shows that the party will continue to play major role in the country for years to come. 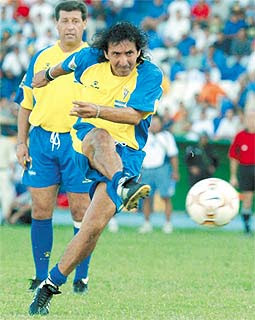 Tuesday El Salvador's greatest football (soccer) player turned 54. Jorge "El Mágico" Gonzalez thrilled football fans around the world with his fantastic skills during the 1980s. The sports section in the Salvadoran newspaper La Prensa Grafica on Monday devoted to El Mágico was almost as large as the election news coverage. According to provisional vote totals from yesterday's elections, the conservative ARENA party appears to have been the biggest winner for both El Salvador's National Assembly seats and mayors. ARENA won 33 seats in the 84 seat National Assembly. This is one more seat than the party won in the 2009 elections, but is more impressive when you consider that 12 deputies had defected from ARENA to form the GANA party leaving ARENA with only 20 seats in the National Assembly. GANA was running in its first elections, and managed to capture 11 seats. Together with ARENA, their 44 seats could be a strong majority bloc in the National Assembly. Although it is still possible that the FMLN, GANA and CD could be a majority voting bloc with 43 votes. The polls are closed in El Salvador. Now the vote count starts. You can see the preliminary vote results at the TSE web site at: http://elecciones2012.tse.gob.sv/inicio.htm. In one aspect of transparency of the Salvadoran electoral process, you can drill down in the results all the way to individual voting tables. I am not in El Salvador for this election, but I've been monitoring the press and social media, and here are some initial comments on this election day. In general, it seems to be a good day for Salvadoran democracy. Not without problems, and not without some controversies, but generally voting seemed to proceed as intended. For a good English language overview from El Salvador, read this post at El Salvador from the Inside. The polls are open in El Salvador for voting for mayors and legislators throughout the country. If you want to follow it live in the "Twittersphere", use the tag #EleccionesSV. The polls will close at 5 p.m. El Salvador time (6 p.m. US Central Daylight Time). The election authorities will publish the votes as they are submitted at this site: http://elecciones2012.tse.gob.sv/inicio.htm. This Sunday, March 11, will be the ninth national elections in El Salvador since the 1992 peace accords which ended the country's civil war. Voters will go to the polls to elect deputies to the National Assembly and mayors in all the country's municipalities. Here are some of the things I'll be watching for, in addition to simply counting how many municipalities and legislative seats are gained by each of the political parties. The rules for voting have changed, how much confusion is there at the polls because of residential voting or the voting for individual candidates? Now that voters can express their preferences for particular deputies, do any of the party regulars lose their seats in the National Assembly? How well do the very few independent candidates fare in the elections? In a television interview on Univision yesterday, Salvadoran president Mauricio Funes claimed that the rising homicide rate was not an indication that the public security policies of his administration were failing. Instead he insisted that 90%(!) of the murders were not of innocent civilians, but were disputes between gangs over territory or the settling of grievances among the maras, or struggles to control narcotics trafficking. (ContraPunto reports that Funes repeated his 90% claim later in a speech in Izalco). Funes also dismissed claims that his government was militarizing public security as just the complaints of the "radical left." In answer to another question, he stated that neither he nor his government had ever been in favor of current proposals from the president of Guatemala to decriminalize drugs, and Funes rejected the suggestion that he opposed such proposals because of US pressure. Mike Allison,whose Central America Politics blog I regularly refer to, has an article on the Al Jazeera website titled El Salvador's brutal civil war: What we still don't know. He summarizes the discussions from a gatherings of historians in San Salvador who came together to discuss the historical record of El Salvador's 12 year civil war. The seminar was sponsored by the Unit of Investigations About the Salvadoran Civil War of the University of El Salvador.